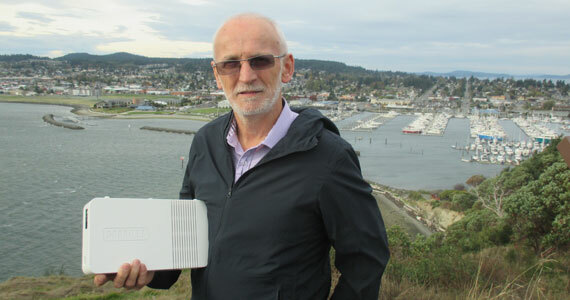 A few weeks ago, we met Ron Chapman, President ASI (Australia) in a small town on the Washington coast and he told IFExpress of a development he has had in the making for some 20 years. We were blown away hearing what he said because it sounded like he has spent his inflight connectivity career leading up to product names that sound like they are out of the jungle… names like CHiiMP, GRRRILL, KONNG, and FFLYA. We couldn’t get them out of our mind and we even snuck them into our IFExpress conversations over the last few weeks to get your attention. If we now have it, check out our story below because ideas like these from Ron Chapman have the power to change connectivity techno-scenery around this crazy business forever! To give our readers a better insight into the 11 hours of product discussions we had with Ron, we thought a running discourse from Mr. Chapman might better set up the latest developments in his connectivity technology solutions… so listen close. We should note that the following technology developments are not just a technical wish list, they are discussions about a product that is flying successfully on over 35 business jet aircraft. Yes, you are correct, if this develops as we see it, it is a big deal! Find a business model that was comparable to what people would expect on the ground, particularly in the area of every day communications, such as Email and SMS. Replace the Wi-Fi protocol; Wi-Fi constantly transmits and that costs power and it must have live broadband to connect to. Further, it is not optimized for satellite transmission. Reduce the equipment investment; Combine COTS technology with better techniques for certifying and manufacturing the systems. Maximize the data throughput to minimize data cost; create protocols specifically optimized to existing satellites and existing avionics hardware that supports them. Provide a method for business clients to monitor and control their usage and reduce pilot operating cost, including a new pricing model that would turn live Internet into a money making proposition for charter operators instead of a constant argument over a huge bill. For airlines; find a way to underwrite the transmission cost using embedded advertising. This could ensure every message pays for itself and generates further revenue opportunities for the airline from sponsored messages. Create an exclusive in-flight client database which can be mined, and grows as each airline comes onboard, which will simultaneously enhance the potential to attract sponsors. On the other hand, KONNG works on the Inmarsat SwiftBroadband (SBB) satellite network and like CHiiMP, it works with an existing SBB transceiver. Because of the greater bandwidth offered by SBB, KONNG offers Internet access in addition to SMS, Email and voice calling. While SBB works in most parts of the world, its coverage isn’t as widespread as Iridium and it delivers its’ capability thru Inmarsat. Note: In case you think Bluetooth Smart may be an issue with your communication device, here are a list of operating systems that comply: iOS 5 and later, Windows Phone 8.1, Windows and later 8, Android 4.3 and later Blackberry 10, Linux 3 and later, and Unison OS 5.2. While all PEDs should be switched OFF and fully disconnected from any in-seat electrical power supply during critical phases of flight, the operator may consider that these restrictions associated with active transmitting devices does not need to apply to low power transmitting devices that are fully compliant to the Bluetooth standard. ASi is able to provide these In-Flight Personal Area Networks (IPAN) at a low cost structure because of Bluetooth’s expanded range and speed since its first limited uses years ago, in addition to the lower certification costs compared to Wi-Fi. Bluetooth only uses 10 milliwatts of power, so it is completely safe for use on the aircraft and does not require extensive certifications like high-powered Wi-Fi networks do.